This is a bicycle handlebar extension bracket, used for mounting a cell phone on bicycle or motorcycles, the bottom used to adjust the tension of clamps in order to adapt to the different pipe diameter of the bicycle/motorcycle.The clamps with mobile phones can rotate 360 degrees and there's a adjusting knob to fix it, a necessary assistant on your cycling trip. 1.ADJUSTABLE: It has an knob at the bottom used to adjust the tension of clamps in order to adapt to the different pipe diameter of the bicycle/motorcycle. 2.ROTATABLE:The clamps with mobile phones can rotate 360 degrees and there's a adjusting knob to fix it. 3.EXTENSION DESIGN:The head of the bracket can be stretched on both sides to hold most sizes of cell phones. 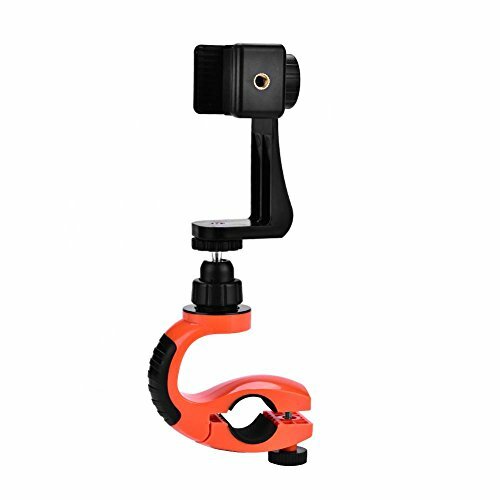 4.MULTI FUNCTION: This is a bicycle handlebar extension bracket, used for mounting a cell phone on bicycle or motorcycles. 5.BEST ACCESSORY:A necessary assistant on your cycling trip, and you will find it useful. Only the Bicycle Extension Bracket, others are just photography props(Not included in the list). ADJUSTABLE: It has an knob at the bottom used to adjust the tension of clamps in order to adapt to the different pipe diameter of the bicycle/motorcycle. ROTATABLE:The clamps with mobile phones can rotate 360 degrees and there's a adjusting knob to fix it. EXTENSION DESIGN:The head of the bracket can be stretched on both sides to hold most sizes of cell phones. MULTI FUNCTION: This is a bicycle handlebar extension bracket, used for mounting a cell phone on bicycle or motorcycles. BEST ACCESSORY:A necessary assistant on your cycling trip, and you will find it useful.